Berkeley, CA (USA) -- Repeat the ancient mantra—Om mani padme hum (“Hail the jewel in the lotus”), om mani padme hum—again and again until the chaos of your thoughts quiets, the thump of your heart becomes clearly evident and your attention turns to the easy movement of breath through your nostrils … in and out … in and out. You’re no longer lost in thought. You’re not spaced out. You’re paying attention to what’s going on in the present moment. You’re meditating. 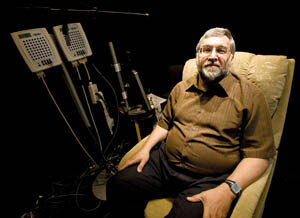 << Clifford Saron, a scientist at the UC Davis Center for Mind and Brain, leads a team of 25 prominent neuroscientists and psychologists working on the Shamatha Project, a complex study of meditation. Buddhists have been practicing meditations like this one and hundreds of variations for more than 2,500 years. It’s only in recent years, though, that the contemplative practice has moved into the mainstream. In 2007, more than 9 percent of Americans were meditating according to the National Center for Complementary and Alternative Medicine. The fascination with meditation continues perhaps driven by a desire to gain health benefits, find spiritual comfort or to say “no” to high-velocity lives that leave us disconnected from ourselves and others. Over the past 50 years, scientists have also been asking questions about the human mind and attempting to figure out the benefits of training it through meditation. Type “meditation” into the PubMed index, and it returns nearly 2,000 published research articles on the subject. Much of the early work is today considered too deeply flawed to be meaningful. But recent work provides evidence that meditation can offer relief for conditions such as anxiety, stress, depression, pain and insomnia. Functional MRIs reveal changes resulting from prolonged meditation in the brains of Buddhist monks. Now, led by UC Davis researchers, the longest and most complex study of meditation ever undertaken is beginning to publish its first results after more than two years spent analyzing mountains of data. The Shamatha Project sought to discover whether anyone can achieve the remarkable calm, focus and joyfulness that monks and yogis display often in the face of great hardship and suffering. It’s a question that hounded Clifford Saron, associate research scientist at the UC Davis Center for Mind and Brain and leader of a team of 25 prominent neuroscientists and psychologists working on Shamatha, since meeting some of these extraordinary people through a study he organized in the 1990s. Just how long or often someone would have to engage in meditative practice to gain these characteristics remains unanswered, although 60 people enrolled in two groups in the project appear to have made strides toward achieving enhanced states of calm, focus and joyfulness after three months of intensive meditation training at the Shambhala Mountain Center in Colorado. Progress was assessed using a variety of state-of-the-art measures, including electrophysiological testing using EEG/ERP and other standard psychological assessment tests. The first official findings released from the Shamatha Project uphold a claim by meditators that the practice improves perception. An article published last month online in Psychological Science reports that study participants became better at making fine visual distinctions and sustaining attention during a 30-minute test. 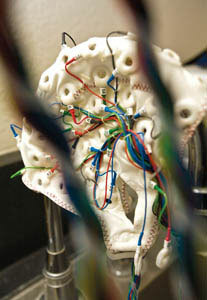 Shamatha Project scientists used a variety of state-of-the-art measuring techniques, including electrophysiological testing, where subjects wear a “wired” cap while they meditate (above), to discover how meditation impacts lives. Lead author Katherine MacLean, who also works at the UC Davis Center and whose work on the project formed the basis of her doctoral dissertation, derived her tests from those used to assess vigilance in radar operators. It’s a lot more complicated than this, but simply put: People watched lines appear on a screen and clicked a mouse each time they spotted one that was shorter than the others. By midway through the study, those who meditate had become better at identifying a smaller difference between long and short lines and at sustaining attention. Adults are usually lousy at paying vigilant attention, especially when the task is monotonous or boring. Most begin making mistakes on this test within 10 minutes. But as it became easier for meditators to pick out the shorter lines, they were able to sustain their attention for longer periods. What does all this have to do with whether or not ordinary meditators can achieve the kind of joyful compassion that Saron witnessed in yogis and monks who’d spent a lifetime in meditative training? Most of us have trouble tapping into what we’re thinking and feeling in the moment, or a few minutes later, or even hours or days later. That’s understandable since more than 99 percent of our experience is not in our conscious awareness. But what if through meditation we were able to rest between our thoughts and feelings long enough to identify them as they occur? We then might be able to gain control of our thoughts, learn to regulate our emotions, and improve our ability to act with kindness and compassion. This is the potential some believe mediation has for transforming our lives. It’s what the Shamatha Project set out to examine: How does meditation practice affect people’s lives in the world? Although the Shamatha Project was first conceived by Buddhist scholar B. Alan Wallace of the Santa Barbara Institute for Consciousness Studies years ago, it didn’t officially begin until early 2007. That’s when two groups of 30 people ages 21 to 70 with varied experience with meditation—one served as a control group and later also took the training—were recruited. During the three-month experiment, they spent on average five hours a day practicing an array of meditation techniques taught by Wallace, including a focus on breath. Did intensive practice help participants regulate their emotions or increase compassion? The scientists assessed emotional responses by showing the meditators graphic scenes of human suffering and recording the minute changes in facial expressions that reveal emotions. They will compare these observations with how the retreatants said they felt when viewing the images to evaluate awareness of emotions. To get at emotion regulation and compassion from another angle, researchers showed documentary footage of soldiers bragging about getting psyched up to shoot Iraqis. These were followed by images of suffering—including children—and soldiers describing the difficulty of the war. Preliminary findings indicate that those who had been practicing intensive meditation were less likely than controls to show emotions that may be interpreted as distancing themselves from others. In addition to the improvements in what Buddhists call “attentional vividness,” those receiving the intensive training overall experienced greater well-being and less anxiety than those who did not undergo the training. Reports that tie results together will be forthcoming. For more information on the Shamatha Project, go to the UC Davis Center for Mind and Brain website at http://mindbrain.ucdavis.edu, or to www.shambhalamountain.org/shamatha.